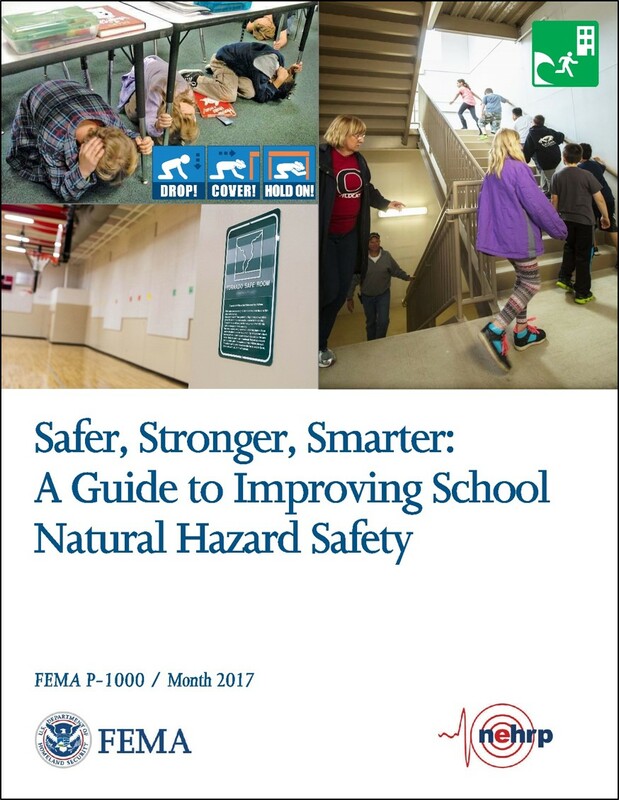 FEMA P-1000, Safer, Stronger, Smarter: A Guide to Improving School Natural Hazard Safety, offers actionable advice on how to improve the safety of schools in the United States from various natural hazards, including earthquake, tsunami, flood, hurricane, tornado, and windstorm. FEMA P-1000 focuses on both operational guidance (i.e., what to do before, during, and after an event) and on the physical protection of school facilities (i.e., what can be done to the structure and facility to improve safety). It aims to equip school safety advocates and stakeholders, including school administrators, facilities managers, emergency managers, emergency planning committees, and teachers and staff at K through 12 schools. It can also be valuable for state officials, district administrators, school boards, teacher union leaders, and others that play a role in providing safe and disaster-resistant schools for all. Parents, caregivers, and students can also use this Guide to learn about ways to advocate for safe schools in their communities.